Shorter days and colder temperatures made me crave a long, enveloping story with equal parts warmth, adventure, suspense, and romance. I found it in Donna Tartt's new novel The Goldfinch. Her earlier The Secret History and The Little Friend were creepily entertaining, in the gothic romantic vein, while this book is of an entirely different mettle. To my mind, this is Tartt's first serious novel, still entertaining, yes, but less satisfied with just shocking her reader with how warped the human spirit can become. Still compelling, but one feels this story anchored by big themes. One theme is identity and the part that events, other people, and oneself play in its formation. The second is art, the role of a thing of beauty, and what gives it value. The third is fate, embodied in an act which propels the plot and gives this story its contemporary feel - that is a random act of terrorism which occurs in New York. It was Mr. Barbour who opened the door: first a crack, then all the way. "Morning, morning," he said, stepping back. Mr. Barbour was a tiny bit strange-looking, with something pale and silvery about him, as if his treatments in the Connecticut "ding farm" (as he called it) had rendered him incandescent; his eyes were a queer unstable gray and his hair was pure white, which made him seem older than he was until you noticed that his face was young and pink - boyish, even. His ruddy cheeks and long, old-fashioned nose, in combination with the prematurely white hair, gave him the amiable look of a lesser founding father, some minor member of the Continental Congress teleported to the twenty-first century. He was wearing what appeared to be yesterday's office clothes: a rumpled dress shirt and expensive-looking suit trousers that looked like he had just grabbed them off the bedroom floor. Note that she doesn't merely describe his appearance. In a short paragraph, her character performs an action, speaks, is given essential backstory, is then physically described and in the last sentence, we not only learn how he is dressed, we are brought up to the moment in understanding the last thing he is imagined to have done before we met him. There were at least a dozen people on the floor - not all of them intact. They had the appearance of having been dropped from a great height. Three or four of the bodies were partially covered with firemen's coats, feet sticking out. Others sprawled glaringly in the open, amidst explosive stains. The splashes and bursts carried a violence, like big blood sneezes, an hysterical sense of movement in the stillness. I remember particularly a middle aged lady in a bloodspattered blouse that had a pattern of Faberge eggs on it, like a blouse she might have bought in the museum gift shop, actually. Her eyes - lined with black makeup - stared blandly at the ceiling; and her tan was obviously sprayed on since her skin had a healthy apricot glow even thought the top of her head was missing. The common thread running through her three novels might be obsession and what drives it. Whereas in the first two novels the emphasis was on obsession as a sort of sickness, the product of a warping of character, here the obsession begins in a child as an attempt to find a stand-in for love, giving the obsessive an innocence. If he is not perfectly likeable at every turn, Tartt is too smart to create so one-dimensional a character, he is recognizable as the victim of a violent act at once familiar and imagined. Although he begins as a victim, the 'spine' of her central character, Theo, might be growing into the realization of the role we play in giving things meaning - art, other people - and in determining the outcome of our "fate." I found this a bigger book than Tartt's two others in every sense. While being more weighty, the narrative tore by at no less a wildfire pace that in her previous bestsellers. 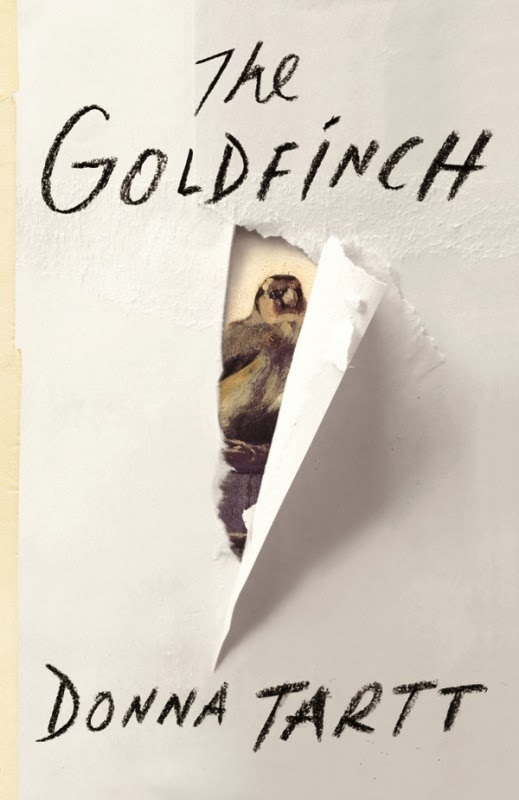 The Goldfinch is a satisfying and involving winter's tale. I am finally reading THE SECRET HISTORY - somehow just never read it. It is so up my alley, with all that cultish sociopathic stuff. Looking forward to reading her other stuff now! I can definitely see you enjoying that book. I read it when I was home sick and it added to the creep-out effect. Hi Ted! My book club just read this and we're discussing it tomorrow. (I've given them all your blog link as well). The final 10 pages of this book I found to be profoundly beautiful. Sending you love and can't wait to follow along! Hi Betany - Glad that you and your book club enjoyed this too - I read it with my book club too. Hope I will see you in NYC before too long.